See our Budget Billing page to enroll or learn more about the program. Can I use a credit card to pay my utility bill? Yes. If you are a residential customer, call 253-502-8608 to pay your utility bill over the phone using your Visa, MasterCard or Discover debit or credit card. You will need to provide your account number, the last four digits of the primary account holder’s Social Security number and your debit or credit card number. You will receive a confirmation number after the transaction is finished. Yes. 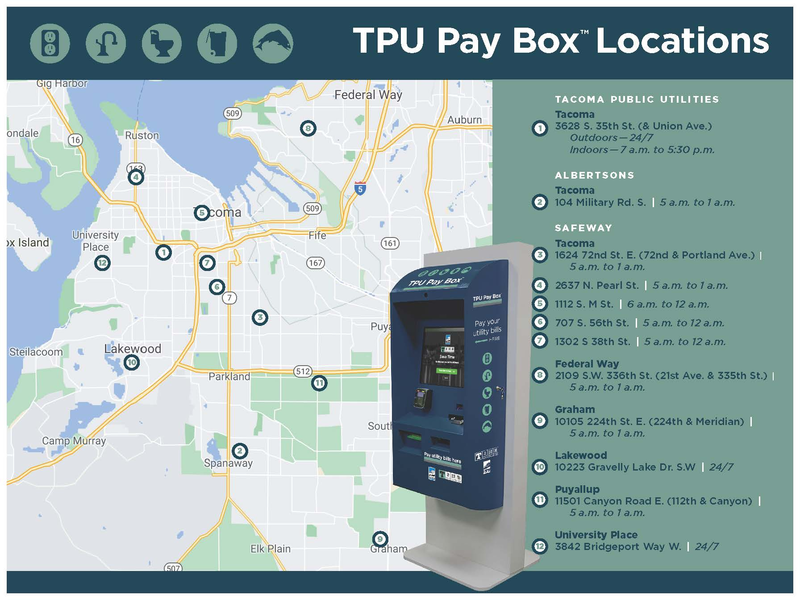 The City of Tacoma and TPU offer a program called Internet Self Service that allows you to view and pay your bill online. You can pay by either automatic draft from your checking or savings account or with your Visa, MasterCard or Discover debit or credit card using MyAccount. Along with paying online, you can also pay your bill by mail, at local Pay Boxes, over the phone and in person at our office 3628 S. 35th St., Tacoma, WA 98409-3192. Learn more about all your payment options. For many accounts, we offer an alternate due date option of the 10th, 20th or 30th of the month. Please contact Customer Services at 253-502-8600 for more information. What if I cannot afford to pay my utility bill on time? Utility payments are due 15 days after the bill is mailed. The due date is listed in the top right corner of the front page of your bill and in the top right corner of the detachable payment stub. However, if you are unable to pay your bill on time, we can help. The first step is to log on to MyAccount or call our 24-hour automated customer service line at 253-502-8608 as soon as possible to make payment arrangements. Calling early gives you greater flexibility and helps prevent any disruption in your service. Please note that late payment charges are added to bills not paid on time. The charge is $3 or 1% of the outstanding bill, whichever is greater. Unpaid bills and deposits may also result in a service disconnection, and there are additional fees to reconnect your service. So it is in your best interest to request payment arrangements as soon as possible if you cannot pay your bill on time. What are the customer charge, energy charge and delivery charge I see on my monthly electric bill? The customer charge covers administrative costs such as reading and servicing your meter, preparing and mailing bills and maintaining and updating billing records and applicable franchise fees. The energy charge covers the cost of producing electricity. The delivery charge reflects costs relating to poles, lines, transformers and other equipment that delivers electricity from its source to your home. Learn more about the charges on your bill. Can I read my own meter and call and report the readings to TPU? No. To ensure your meter is accurately read, a TPU technician must do the readings. Plus, with more than 180,000 customers, we cannot answer the high volume of calls this process would create. Do I have to pay a deposit for service? Depending on your situation, you may be required to pay a deposit for electricity, water and/or commercial solid waste services. However, security deposits may be waived for property owners who have established a satisfactory payment history with us. Learn more about our deposits. Reading your electric meter is a great way to track how your home is using electricity. First, read all the dials from left to right and record the smaller of the two numbers on either side of the pointer. Then, to figure out how much electricity you have used, subtract the previous meter reading from your present meter reading. Most residential meters have signs that read “multiply by 10.” This will give you the number of kilowatt-hours of electricity you have used since the last reading. Do I need to be home when electric service is being connected or reconnected? In most cases, you do not have to be home when your service is connected or reconnected. Trees are growing into my power lines. What should I do? If trees are growing into the transmission or distribution power lines, please call Tacoma Power’s Tree Trimming and Removal line at 253-502-8729. Please note we will not trim trees on private property that are between the utility pole and the home. 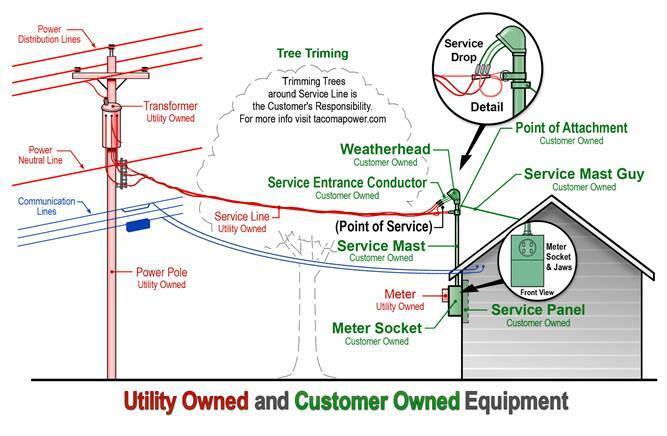 Learn more about tree trimming around power lines. To better understand electrical components you are responsible for maintaining, see our electrical equipment diagram. Business Hours: Monday through Friday, 8:00 a.m. to 5:30 p.m.
For more information, visit our Outages & Safety page. *Starting Feb. 11, 2019, the Tacoma Water Permit Counter will be open Monday – Friday from 10 a.m. to 4 p.m.
Monday – Friday, 8 am – 4:30 p.m.